Whether it’s ballet or baseball, fans relish all aspects of the experience. 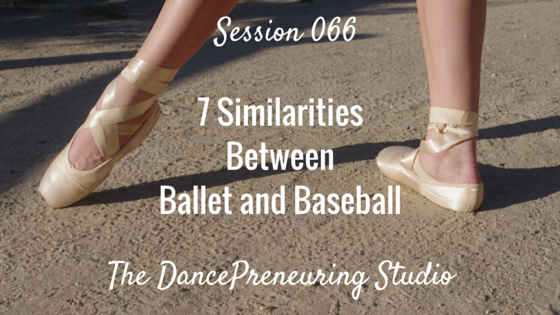 In the latest session of The DancePreneuring Studio, I share 7 similarities between the two sports. Freestyle Flow: A friend of mine recently introduced me to something quite exquisite on a recent trip to the Abbott Kinney area in Los Angeles and we stumbled upon Intellgentsia Coffee. Turns out he’s quite the coffee snob. But I get it now! He told me that there was one place he went to that the cup of coffee was so good–no cream, no sugar or anything additional needed, and it tasted like he was having a blueberry muffin from a cup. Yum! He did warn me that it can be hit or miss and that it’s best to drink the beverage immediately so you can taste the different aspects of the coffee. I noticed that the flavors were more distinguishable and the tastes did change as the coffee cooled. When I get interested in different subjects, I start researching so I found info on a coffee convention and looked up different pour over places in the surrounding areas. 1. People like to be entertained, whether baseball or something else, and in my case, it’s almost anything dance and art related. 2. There are die hard fans who know all the facts and have the memorabilia related to their interests. 3. There is significance in celebrating pioneers in your field. In this case it was Jackie Robinson day and dance history is preserved and celebrated when ballets by choreographers such as George Balanchine are performed. 4. Professionals make performance look effortless. On the outfield you don’t realize when you you’re in the stadium how much ground the players have to cover. With dance, it can look easy but you don’t realize what it took to get to that point. 5. Fans love interactive experiences. In this case, we got to go out onto the field to watch the fireworks. They were also giving out free shirts with Jackie Robinson’s number to commemorate this day in history. In dance, it can be the opportunity to take a company class with the members or meet the artistic director of the dance company. 6. No matter how many times you watch a game or performance, you still love the sport. 7. The venue gives a sense of community. In baseball it can be the smells of stadium food such as popcorn and seeing the vendors go up and down the aisles, the wave from the crowd, the cameras. In a theater, it could be the lights, the sets, the orchestra pit and the mere anticipation of waiting for a performance to start. Question: What do you enjoy most about events that you go to?